The Original Mattress in a Box and one of our Common Sense Mattress® series. When you want all-around excellent foam mattress, our Adjustable Ultra Plush will deliver. This exceptional latex mattress is our No. 1 seller for very good reasons. It offers an awesome design in an adjustable latex sleep system. Featuring all Talalay Latex, this latex mattress is the best there is. To make the deal even sweeter, we make sure our customers get the best prices going on superior twin, full, queen and king mattresses. Just show us a better price and we'll beat it. When budgeting and comfort both matter, this choice tops other foam mattresses. Mix and match firmness layers to get the perfect feel. Zippered cotton cover quilted to 1.5 inches of pure, natural Joma Wool with Tack and Jump pattern for that plush feel. Our firmness layers are available in soft, medium, and firm. Each king, queen or full mattress consists of 2 pieces of latex. The 2" Talalay latex foam mattress topper is super soft (#22 ILD) and is one piece and lies on top (watch video) of the Talalay latex core of your choice (soft 28 ILD, medium 32 ILD or firm 36 ILD). Twin and Twin XL are one piece only. These mattresses are designed to ship UPS. Use your existing firm box spring, foundation or platform! These cores are easy to exchange via UPS if you desire a different firmness. Our shipping is offered via UPS. Returns and exchanges are subject to standard UPS fees. To make sure our customers are completely happy with our foam mattresses, we offer a 60-day satisfaction guarantee. In addition, this latex mattress is backed by our 20-year limited warranty. Assembly is easy; just slip the cores into the zippered cover. You may choose the softer side up (topper side) or the firmer side up. Mattress is 8.5" thick. This latex mattress compares to Sealy Reflexion and NaturesRest however, without, the cheap poly-urethane foam edges. Slip covers are available in matching fabric for your existing box springs or foundation. Call for pricing. We also offer a natural bamboo cover upgrade. 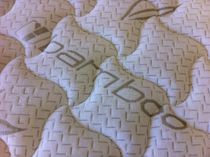 Why Is Talalay Latex Better Than The Dunlop Process? At the Arizona Premium Mattress Company, we feature the Talalay process in most of our foam mattresses. This is a highly controlled, sophisticated latex manufacturing process that produces the highest quality, most consistent latex available in the world. An alternative technology, known as the Dunlop process, is the most commonly used production method globally and has a massive following as well. There is no right or wrong choice but Talalay does mold to your body better and that's especially important if you sleep on your side. Dunlop latex creates a firmer product that is most often used as a base core component. The difference in the processes involves what happens in the mold just before the initial latex curing stage. The Talalay process involves only a small amount of latex compound in the mold. Air is extracted to distribute the foamed liquid inside the mold and to create a consistent round, open cell structure. 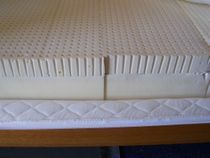 The latex mattress core is flash frozen to lock the cell structure in place and to prevent the particles from settling. In the Dunlop process, the molds are filled to the rim, air is not extracted, and there is no freeze stage. Therefore, the latex cell structure is less airy. Gravity takes over settling the particles to create a more dense product than Talalay latex. As a result, the Talalay process for making a latex mattress offers a much wider firmness range so it can provide enhanced comfort choice for consumers around the globe. What's the Difference Between Blended Talalay and All Natural Talalay? Without a doubt our most frequently asked question. Natural talalay has a very luxurious feel but is not as durable as the blended talalay. It's kind of like comparing 24K gold to 14K gold. One is much more expensive and luxurious but the other is much stronger because it has metals infused to give it a better life span. Both still look great and it's hard to tell the difference. Utter nonsense and this type of advertising practice has no place in the mattress industry. It casts a darkness over these wonderful eco friendly mattresses that may scare people away. Talalay latex, whether blended with stronger man-made latex or all natural, meets the highest criteria and certifications our industry offers and is safe for infants. The Oeko-Tex Standard 100 is a globally uniform testing and certification system for textile raw materials, intermediate and end products at all stages of product. The certification ensures that the products do not contain harmful substances and are not harmful to one's health.